Emu birds have a history of 80 million years about their existence in the Australian region and the other parts of the world. Emu’s species is Dromaius Novaehollandiae. Emu belongs to ratite family of flightless birds such as ostrich, rhea, cassowary, and kiwi. Emu birds can live in an excessive cold or excessively hot weather. Therefore, this bird is found in everywhere in the world. Generally, an Emu bird lives up to the age of 30 years. Emu birds are friendly and they can live in the grassy land and dry open farms. Emu grows faster than other birds. An emu grows from 5 to 6 feet in height and 45 to 60 kg’s in weigh. Emu’s reproduction capability is at least 25 years of age. The legs of emu birds are very strong, so, they can run faster than other birds. You would be surprised to hear that an EMU bird can run 40 miles in an hour. Emu bird is used in the world for various purposes such as meat on the table, oil for skin and shoes and handbags in highly fashionable stores. 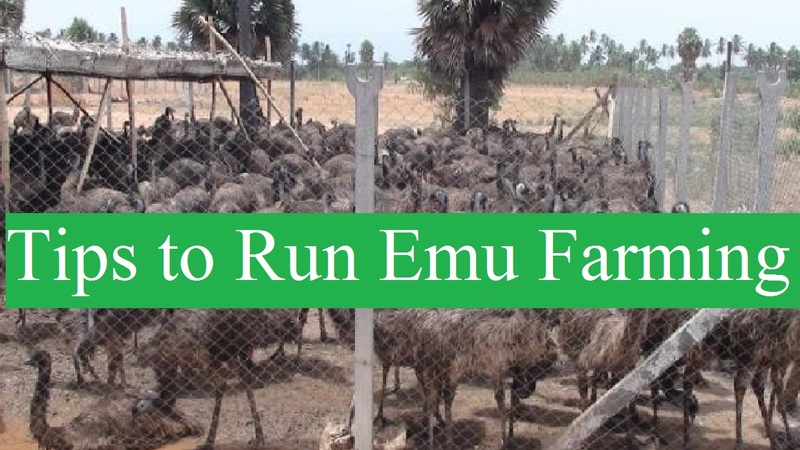 You have to select a suitable location for commercial emu farming. Actually, it would be better if you have your own land. Before selecting the location for emu farming, you have to think of some important factors like the availability of fresh and clean drinking water, proper nutritious food source, availability of cheap labor, medication facilities, proper transportation system, suitable market near the farm etc. You have to be very conscious of these factors before the selection of the location in emu farming. You have to take care of emu chicks very minutely. You have to keep the newly born emu inside the incubator. You have to set up a brooder and keep the brooder in ideal temperature. You have to keep sufficient feeders and water pots under the brooder. You have to provide the chick’s starter mash before reaching their body weight 10kg. You have to ensure proper run space the healthy life of emu chicks. You should be careful about the dampness of the floor of the chicks. Do not overcrowd the pen. You have to be very careful regarding the selection of emu birds and keep knowledge of Emu breeding. You should not keep the chicks or grower with the adult emu. You must have the technique of emu breeding. The laying season of emu birds starts from October to April. Emu birds will lay an egg every 3 to 5 days during breeding. At the time of breeding, the producers must have to be very conscious of the emu. The egg of emu bird is dark green in color. Generally, female emu birds lay the egg every 3 to 5 days. The eggs of emu birds are covered by the male emu with leaves, grass, straw and other things available for running the incubating process. You have to keep the collected eggs in the electric incubator. Besides, you have to provide adequate food and water there. You have to provide nutritious food to your emu chicks so that they can grow very quickly. In this case, you can take help from the near emu farm. Emu chicks may affect any time in health. You have to use proper vaccination in this case. Besides, you can take help from the professionals in this case. You can think of marketing of emu birds. You can sell emu’s meat, oil for skin and feather for various shoes in the supermarkets. For proper marketing, you can give add or use a website to which you will refer your emu products. In summing up, I want to say that Emu farming is absolutely a lucrative business in the world. So, before starting this business, try to remember the above-mentioned tips.